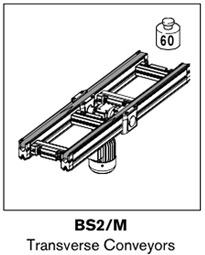 Transverse conveyors are designed to transfer pallets for short transport distances (e.g. 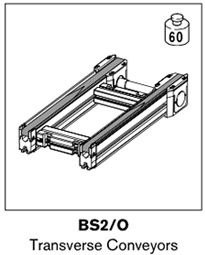 between two rectangular lines) or as cycle-independent workstations. 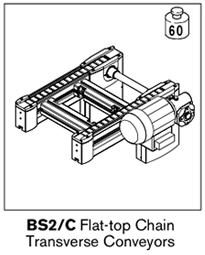 The BS2, BS2/M, and BS2/K are powered units that use standard or antistatic toothed belts for pallet transport. 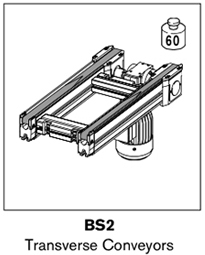 The BS2/0 is a non-powered toothed belt unit designed to be driven by a standard BS2 using a special drive coupling, thus saving the cost of a gear- box and motor. 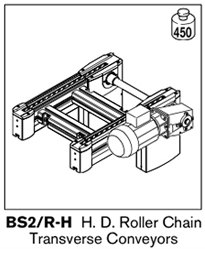 Unless otherwise stated, transverse conveyors are reversible. 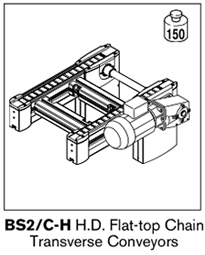 Flat-top chain and roller chain BS2 units are available in standard and heavy duty configurations and provide increased payload carrying capacity. 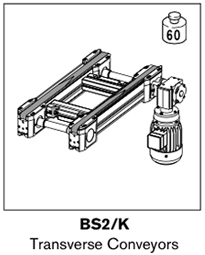 Specify conveyor width, length, conveyor speed, motor voltage/frequency, motor position, and motor orientation when ordering. 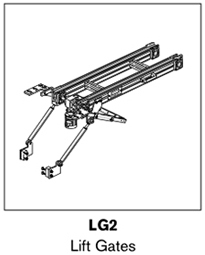 The LG2 lift gate kit provides personnel and vehicle access through a conveyor line and uses a standard BS2 unit.